That was Casey B. Mulligan, Professor of Economics at the University of Chicago, writing in the New York Times on October 09, 2008 about what he then considered to be a robust economy. The official unemployment rate for the economy that Professor Mulligan was writing about, the U.S. economy, steadily climbed since he shared his wisdom with the world; according to the latest figures released by the U.S. Bureau of Labour Statistics, the official unemployment rate stood at 9.8 percent in September 2009. Despite the best wishes of Professor Mulligan and his colleagues at the University of Chicago, the unemployment rate has decided to move in the opposite direction. According to all sensible estimates, it will cross 10 percent by the end of 2009 and stay close to that figure for the next year. Even this high figure for the official unemployment rate does not capture the true degree of labour under-utilization currently afflicting the U.S. economy. A more comprehensive measure of labour under-utilization that takes account of discouraged workers who have dropped out of the labour force and part-time workers who are searching for full-time employment stands at 17 percent! What is of course interesting is that the school of macroeconomics popularised by Professor Mulligan’s distinguished colleagues at the University of Chicago and elsewhere known as the Real Business Cycle (RBC) view of macroeconomics does not even recognize existence of unemployment. In case you have missed that, let me state it again: for the RBC view of macroeconomics, unemployment, as we understand that term, is a fiction; it does not exist. So, how does this strand of macroeconomics view the fluctuations of employment that goes with the typical business cycle? Here is the story they tell. Every worker derives “utility” (don’t ask what that means) both from consumption and leisure. Now, to finance consumption expenditures, she must work because that is how she can earn her wage income. By working, of course, the worker gives up precious leisure and so experiences dis-utility (again, don’t ask what that means or how it can be measured). It is, therefore, the balancing of the extra – marginal in the language of economists – utility derived from the next unit of consumption and the dis-utility associated with giving up that last bit of leisure that determines whether the worker wants to work or not and for how many hours a week (say). But the worker, as every other agent in the RBC models, are endowed with enormous computing powers; they not only look at the present, they also peer into the depths of the infinite future. It is thus that the balancing of marginal utility and dis-utility takes on an inter-temporal dimension. Depending on the changing incentives to work in different time periods, the worker decides how much labour to supply, i.e., how many hours she wishes to work. The level of employment, and by definition unemployment, is therefore, in the RBC view, driven by changes in the incentives to work; employment is a choice that workers make. There is no unemployment, only equilibrium fluctuation of employment chosen by workers inter-temporally balancing the marginal utility of consumption against the dis-utility of work. According to this view, then, unemployment occurs because workers decide not to take up the offers they get, i.e., when unemployment is observed it is because the workers choose to remain unemployed. There is a hidden assumption here: enough jobs are available to workers, in the first place, to choose from. What if enough jobs are not available? How will workers then choose from jobs that are not even available? Would it then still be possible to claim that fluctuations in unemployment are merely the result of inter-temporal optimization exercises on the part of workers balancing marginal utility of consumption against the dis-utility of work. Evidently not. So, how would we test whether the RBC view of unemployment is borne out by facts? If unemployment is “chosen” by workers, as the RBC view claims, then the number of job seekers and job openings should not deviate too much from each other and certainly not for prolonged periods of time; if, on the other hand, unemployment is forced on workers by the hiring decisions of capitalists, the the ratio of job seekers to job openings should increase secularly during recessions. What does the evidence in this regard show? The Chart plots, for the U.S. economy, the ratio of (a) number of job seekers, and (b) the number of job openings. In December 2000, the ratio was close to 1; thus, in December 2000, every worker looking for a job had, on average, a job available. In December 2007, when the Great Recession started, the ratio stood at 1.7, i.e., on average, every job opening had 1.7 job seekers. As the recession progresses, the ratio climbed steadily and by August 2009, it stood at 6.3. 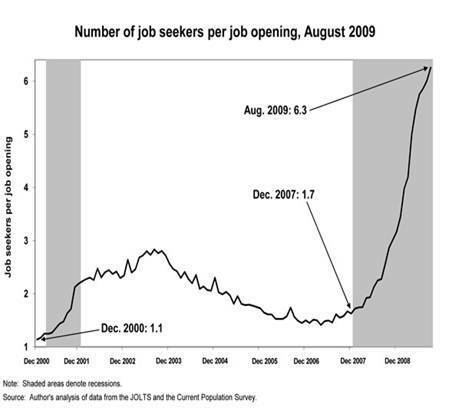 Hence, in August 2009, every job opening had, on average, about 6.3 job seekers. Thus, the ratio continually increased for 20 months, and will possibly continue to do so for the next few months. What do you say, isn’t that evidence in support of the RBC view?